Lots to Do and See in Historic Bar Harbor! Scenic views, relaxing days and plenty of activity await you in Bar Harbor! As a popular New England vacation destination, Bar Harbor offers something for everyone. Whether exploring the trails of Acadia National Park, strolling down historic Bar Harbor or climbing the infamous Cadillac Mountain, a trip to Downeast Maine is well worth it. Located in picturesque Mount Desert Island, nature enthusiasts love exploring the sights of Bar Harbor in all ways imaginable. Canoeing or kayaking along the peaceful rivers, biking around town, whale watching and lighthouse tours are all ways to enjoy a Bar Harbor camping trip. For a leisurely outing, a trip into town invites you to experience a coastal community with a thriving art scene. Quaint shops, unique art galleries and antique stores line the streets of Bar Harbor’s nautical villages. Maine’s Bar Harbor is full of surprises. Encircled on all sides by the natural beauty of Mount Desert Island’s 20 mountaintops, everyday greets you with breathtaking views. Take in the sea breezes with a visit to Mt. Desert Narrows or Narrows Too. Is fishing and boating more your thing? 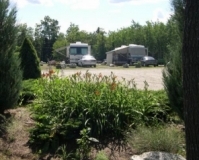 Park your RV at Patten Pond. 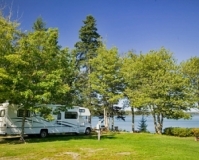 No matter how you like to camp, you'll love the view and all there is to do at Bar Harbor Camping Resorts.